We’re are all now familiar with the Quick Response or QR Code. They have slowly begun to appear on everything from food cartons to billboards. The rise of mobile apps, as well as social media marketing as a promotional channel, offers a whole new world of opportunity for businesses via this method of ‘tagging’. These QR tags offer as may uses as people can think of for them, which so far has been plenty. So what have been the most innovative uses and what have we learned to avoid, when using QR code marketing? One of the most innovative uses we’ve seen has been from Tesco in South Korea. 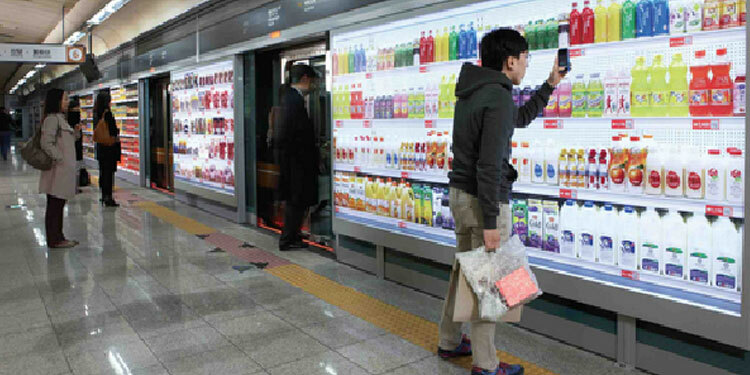 The supermarket put up huge billboards at arm’s reach in a number of underground train stations in Korea. Waiting commuters can then use the QR codes that are placed beside itemson the poster to order their shopping online and not have to bother going to the store. This innovative and time saving use of QR code marketing has seen the idea spread across the city’s train stations. Some tech savvy farmers with tractors in Japan have begun using QR codes on the back of their machines in replacement for 0800 how’s my driving numbers. This is innovative, but also leads you to wonder how you can take pictures of the codes when driving yourself? It is not unknown for people in the world of media to be innovative. And one of the best uses we’ve seen of QR codes has been people who have sent CV links through the quick response codes. This allows potential employees to quickly access a CV online via a smart phone – an eye catching way to get hired. With all this innovation, you won’t be surprised to hear of the flops and mistakes involved in QR codes. Here is a list of things not to do. Yes, it has happened that some companies have begun their QR campaign and placed codes in a number of places at much cost, only to realise the codes don’t work. Test the codes on a number of smart phones before you begin – it may seem obvious but it isn’t always done. It has also happened that companies have placed their QR codes on items to only find out their mobile website pages aren’t compatible with a number of phones. Make sure your page is native HTML5 as if it’s a number of other formats you may have trouble when people scan it. Tesco’s innovative grocery idea worked in Korea as the underground has Wi-Fi. Try a similar idea in signal free London underground and watch how angry you will make people who are unable to link to your page. Give scanners something they want such as a high quality video, or free wall paper. People won’t want to click to see your flyer or you company’s address. Give them a carrot and watch them click on your QR code. We hope you enjoyed our guide to QR codes. Please let us know your favorite campaigns from around the world via our comment section.